AskMigration’s audience (over 5 million views per month on average) is simply a better (natural) fit. With young and career-minded professionals from all 6 continents, browsing our site daily to get more info on Canadian Immigration news and regulations, and browsing our site to find recommended Immigration Professionals such as you, your top-banner ad can get in front of the right audience – for the right price. 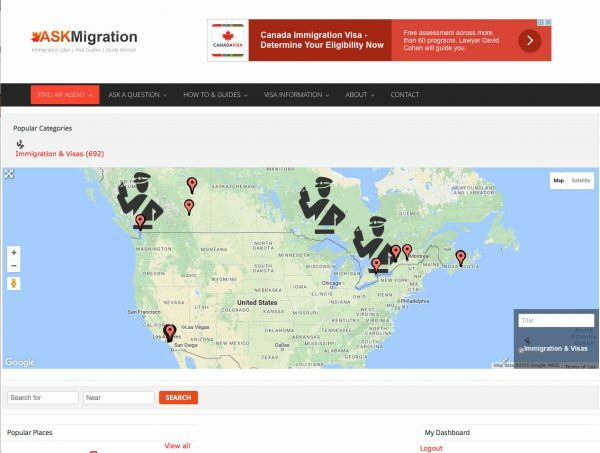 Attached above, you will find screenshots, of our top-banner section (on askmigration.com) featuring some of the more prominent Canadian Immigration Companies, advertising on our platform. As can be gathered from the above, we are ideally suited in crafting total marketing solutions for clients big and small. Let me know your preferred time (PST) so I can give you an introductory call and ideally assess whether we can actually help you get more clients at the best rate possible. We like to promote products and services that provide great solutions for our readers. Your Immigration, Education & Overseas Employment Services are in front of an engaged audience looking to move Abroad. If any of the above fits your current business model, that means you are in the best position ever, to get more leads & more business coming your way!